The image above is the rendering of Blossom – SATS & Plaza Premium Lounge. 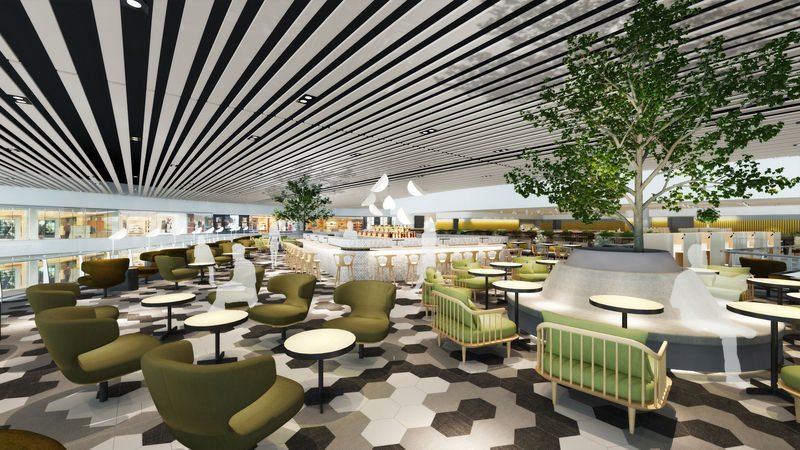 It represents an artist’s impression of the airport lounge in Changi Airport Terminal 4 to be opened later this year. As the first airport lounge network to achieve ISO 9001:2008 certification, the Group has been operating airport lounges, and providing lounge management services for leading airlines, alliances and corporation in more than 150 locations across 36 international airports, serving over 12 million passengers annually. It has received a host of accolades for its hospitality and independent airport lounges, which are bestowed by SKYTRAX in June 2017 the world’s best independent airport lounge award for the second year running. Headquartered in Hong Kong, Plaza Premium Group is the pioneer and industry leader in providing Premium Airport Services in over 150 locations of 36 international airports across the world, with a collective goal of ‘enhancing your airport experience’. The Group comprises four core airport services, Airport Lounge, Airport Transit Hotel, Airport Meet & Greet Service, and Airport Dining. Plaza Premium Lounge, the world’s largest independent airport lounge network, gives travellers a haven away from the hustle and bustle of the airport, a home away from home, by providing a space with top-notch services and facilities for travellers departing, transiting and arriving at major international airports including Abu Dhabi, Brisbane, Hong Kong, Kuala Lumpur, London Heathrow, New Delhi, Rio de Janeiro, Riyadh, Shanghai, Singapore, Sydney, Taipei, Toronto and Vancouver. Comfortable seating, enticing food and beverage selection, showers with amenities, private resting suites, VIP rooms, recharging stations, Wi-Fi, computer workstations are but a few of the services offered to enhance the airport experience. valued customers. By putting into action, the best ideas and practices from across the network and around the world, we focus on innovative and quality products and services. On top of the sublime and opulent independent airport lounges that are in operation, we also manage lounges for leading airlines and alliances including Cathay Pacific Airways, China Eastern Airlines, Lufthansa, Singapore Airlines, Thai Airways, SkyTeam, Star Alliance and American Express. This entry was posted in Singapore, travel and tagged Changi Airport Terminal 4, Plaza Premium Lounge. Bookmark the permalink.